A piece fitted with built-in lighting allows you to create a display in your home for special plates, antiques and more. A cabinet is the perfect place to show off special pieces and built-in lighting takes your display to the next level. With easy to use lighting you can create a beautiful display while also easily working around fragile items. 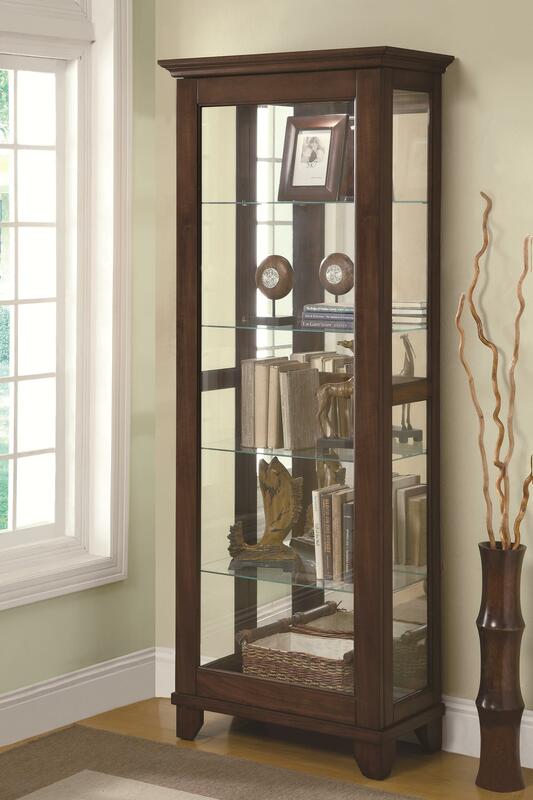 Display your keepsakes and decorative items in this stately curio cabinet. Five glass shelves are set against a mirrored back with dramatic can lighting at the top. 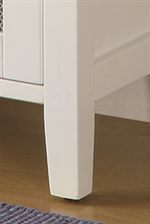 Sleek bracket feet lift the cabinet from the floor for an airy, weightless feel. The rich medium brown finish of the wood construction creates a classic, distinguished look offering an instant upgrade for your home. The Curio Cabinets 5 Shelf Curio Cabinet with Mirrored Back & Can Lighting by Coaster at Al-Mart Furniture in the Oak Park, River Forest, Chicago, Elmwood Park, Forest Park, River Grove, Maywood, Melrose Park, Berwyn, Cicero, North Riverside, Brookfield, Lagrange Park, Franklin Park, Norridge, Oakbrook, Elmhurst, Bensenville, Lyons, Stickney, Harwood Heights, IL area. Product availability may vary. Contact us for the most current availability on this product. This collection of curio cabinets offers a variety of beautiful pieces to decorate your home. Put your favorite valuables, china, home accents, or collectibles on display for all your guests to enjoy. With many different wood finishes and styles, this curio collection is bound to have something to fit your needs. From traditional stylings with ornate woodwork and acanthus leaf decoration to more contemporary, glass-panel designs, these curio cabinets are versatile and unique pieces. Place in your dining room, office space, or living area to add a décor accessory that will not go unnoticed. The Curio Cabinets collection is a great option if you are looking for Transitional furniture in the Oak Park, River Forest, Chicago, Elmwood Park, Forest Park, River Grove, Maywood, Melrose Park, Berwyn, Cicero, North Riverside, Brookfield, Lagrange Park, Franklin Park, Norridge, Oakbrook, Elmhurst, Bensenville, Lyons, Stickney, Harwood Heights, IL area. Browse other items in the Curio Cabinets collection from Al-Mart Furniture in the Oak Park, River Forest, Chicago, Elmwood Park, Forest Park, River Grove, Maywood, Melrose Park, Berwyn, Cicero, North Riverside, Brookfield, Lagrange Park, Franklin Park, Norridge, Oakbrook, Elmhurst, Bensenville, Lyons, Stickney, Harwood Heights, IL area.